The TFV8 Mini V2 (also known as the TFV8 Baby V2) is the upgraded version of the original TFV8 Baby tank. New with this version is the increased coil area mesh coil material. Combined with increased airflow and super large ports, the upgrades make this a great tank for fast and consistent heating and large clouds of vapour. Please note the version shown here is the EU version and is not the bulb tank available internationally. That’s down to EU laws, which limit the size of tanks to 2ml. The result is a solid red and black tank that typifies the Smok look, with a V shape carved into the top to mark it as version 2. The new tank has upped the number of air holes from two to three. Open these large airflow controles wide for maximum airflow and an airy vape - perfect for high wattage vaping. The TFV8 Mini is a top fill tank, with a refill mechanism which comes with a push button designed to ensure the top is secure and to minimise chances of leakage and spillage when being carried around. It also comes with a gasket which has shifted to cover the fill hole to further reduce chances of leakage. The TFV8 Mini is built for use with the TVF8 Mini/Baby V2 Coils: A1, A2 and A3. These are all made with anti-bacterial medical cotton to minimise the transfer of any bacteria. The Baby V2 A1 is a single coil with a larger surface area to ensure e-liquid is heated faster, leading to a better vape and a decreased chance of burnt coils. The A2 and A3 coils feature dual and triple coil holes, both with a mesh design. Mesh coils are designed to last longer and deliver both more vapour and a more consistent experience. For more information see our guide to Mesh Coils. All the coils come with large ports to maximise the flow of juice to the heating elements. 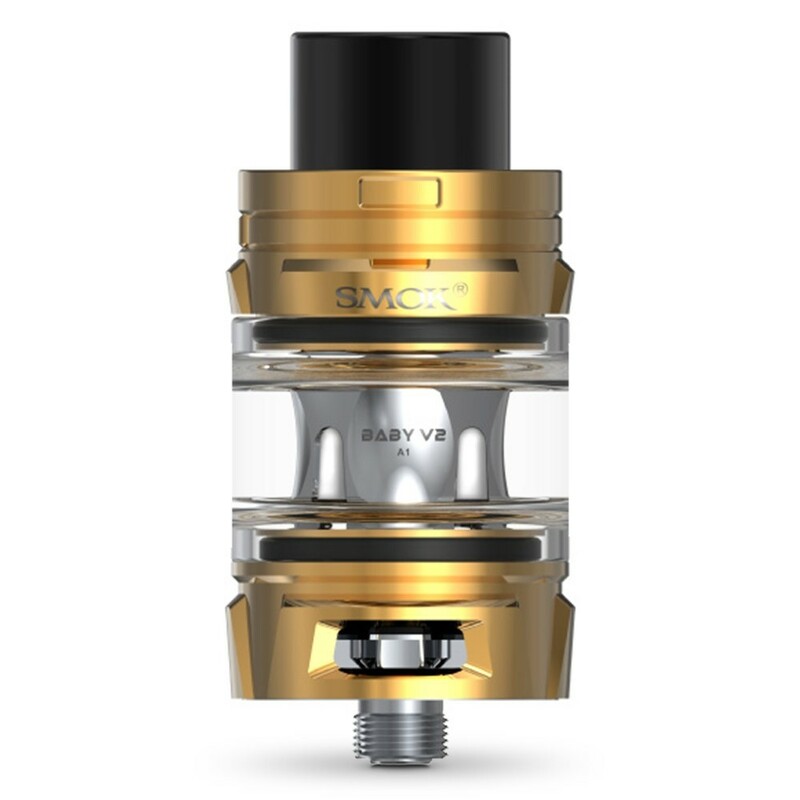 With large wicking holes and high surface area, low resistance coils, the Smok TFV8 Mini is designed for powerful devices capable of putting out higher power levels and for e-liquids with a high VG ratio. Also this makes it great for vapers who enjoy mouth to lung vaping and lots of clouds! As with all coils, but especially low resistance coils like these, it’s important to prime your coils before use. Simply drip in e-liquid into the coil holes and down the center of the tube before using a coil for the first time. After attaching the coil to your tank, allow to soak before using for the first time - for a coil like this, it’s probably worth waiting ten minutes if you can hang on that long! The specs below are for the EU version.